Putting Linux on a long-established brand of notebook PC is like making a 5-year-old boy wear size-12 men's boots. It doesn't fit right. Most computer makers are rushing to embrace the open-source operating system. Dell Computer Corp. is no exception. 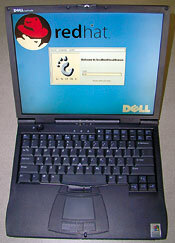 but Red Hat Linux 6.1 from Red Hat Inc. of Durham, N.C., fails to get the most out of Dell's Latitude CPx, among the best portables available today. My test unit had a 500-MHz Pentium III processor, 128M of RAM and a 12G hard drive. Although Dell's notebook is a solid choice for taking Linux on the road, Latitude users accustomed to the usual Microsoft Windows functions will discover that nothing happens, for example, when they highlight a file with the mouse and punch the delete button. File deletion under Linux requires a right-click followed by selecting Delete from a list and clicking it. Many other familiar keystrokes don't work and, of course, the keyboard's Windows Start menu key is useless. Dell has put Linux on its established Latitude CPx but needs to do some more work on the notebook's interactions with the OS. For a system that the manufacturer touts as tuned to Linux, the Latitude CPx is not. The hardware controls do work about half the time. For example, you can brighten or dim the display from the keyboard. But when you try to raise, lower or mute the audio with the sound keys, nothing changes. The volume stays the same. The Dell notebook has other audio problems. Some .wav files work, but other sound files do not. For the most basic audio source, a music CD-ROM, the CPx delivered monaural sound from the left speaker only. The same speakers that produced full and resonant sound under Win-dows now produced sound comparable to a badly tuned AM radio under Linux. The hardware key for switching between the integrated LCD panel and an external CRT monitor does work, although both monitors cannot operate at the same time as they can under Windows. Linux has no battery monitor like the one on Windows' taskbar tray. Pressing the Fn key plus F3 will show how much battery life remains, however. In normal operation, I got more than three hours of battery life'pretty good with display, CD-ROM drive and processor all fairly active. But the lack of hardware integration with the OS means there is no warning when the battery is about to die. The notebook simply shuts off. Swapping between the CD-ROM and floppy drives was pretty easy. Linux did not always mount the correct drive automatically. But invoking the included disk utilities did give me quick access to the drives without having to reboot or suspend as you must when running Windows 98. The drives almost seemed hot-swappable. Dell included a 10/100-Mbps PC Card network interface, but the software was for Windows only. Moreover, although I could see a PC Card interface load in the OS shell, I could not get the card to work on the GCN Lab's LAN, much less the Internet. Dell did not include any special documentation for the Linux version of the notebook. It's needed. The touchpad and eraser tip pointing devices both worked well under Linux, and the 14.1-inch display produced bright images. The Latitude CPx is one of my favorite notebooks. But Dell needs to do more Linux tweaking to make a better fit for the notebook. At the moment, users have to pull themselves up by their own bootstraps.